Convert images into PDF Generator offers an optimized application to change image into PDF documents with good quality. Images to PDF converter graphics, text and resolution without any misrepresentation in original format. JPG to PDF utility is fully compatible in compression of high resolution heavy image files to lighter and precise PDF files. Images in PDF software insert images JPEG, JPE, JFIF, BMP, PNG, TIF, TIFF, GIF, JPG, ICO formats and click Convert button. Images to PDF converter supports quick conversion of set image files into PDF document. Image to PDF application convert image files format into PDF For e.g ICO to PDF, GIF to PDF, BMP to PDF, TIF to PDF, TIFF to PDF, PNG to PDF, JPG to PDF, JPEG to PDF, JPE to PDF, JFIF to PDF documents. Multipage image to adobe PDF Converter software convert correctly all images one by one into PDF. * Image to PDF Creator Image conversion supports batch image conversion. * Images to PDF Converter convert insert merge multiple frame JPG into PDF. * Image in PDF Converter Successfully runs under Windows 7, Vista, XP, 2003, ME, NT, 2000, 98. * Images in PDF Converter Supports to convert all image formats such as PNG to PDF, JPEG to PDF, JPG to PDF, BMP to PDF, TIFF in PDF, GIF in PDF, TIF in PDF, etc. * Images to PDF Converter Supports all type of graphics, faxes, scans, pictures, photos, images, photographs, stills, snaps, shots, screenshots, etc. * Image to PDF Conversion utility has option to change page size, page margin and image size. * Image to PDF Converter creator join combine merge add turn import multiple images, graphics, scans, faxes into PDF files. * Image to PDF Maker has option to make PDF of all listed images in one PDF file or individual PDF files. 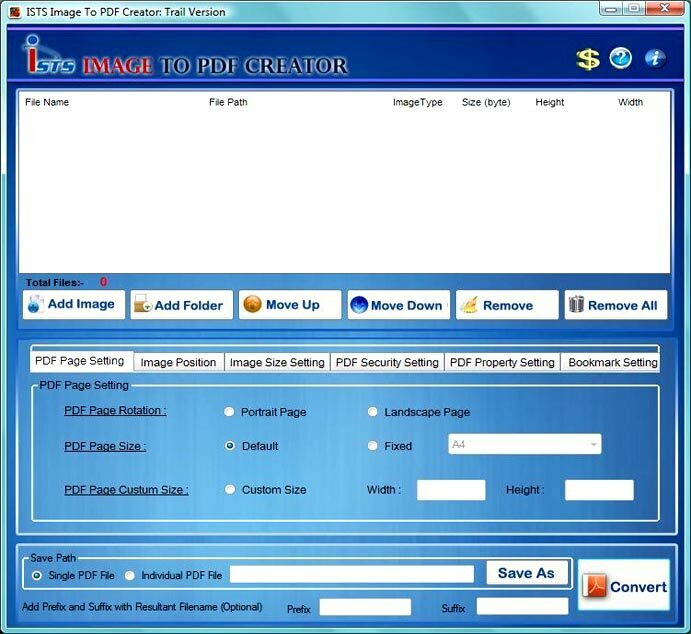 * Image into PDF Converter Supports batch image conversion.